Mali In Crisis Fractures Along Twin Fault Lines After 20 years of apparent stability in turbulent West Africa, Mali is now battling dual crises: a rebellion in the north, and a military coup in the south. There are reports of gross human rights abuses, as well as fears that the Islamist-controlled north is fast becoming a terrorist safe haven. A rebellion in northern Mali, followed by a military coup in the south, has shattered the veneer of stability in a country that was hailed for 20 years as a model democracy in turbulent West Africa. Now Mali is facing twin crises, prompting regional and international fears that the north — currently controlled by jihadists — is a terrorist safe haven. And the politicians who are meant to be fixing the problems are bickering. Mali's interim president, Dioncounda Traore, says his priority is to liberate the Sahara Desert nation's northern region and drive out al-Qaida-linked Islamist extremists, who, after a rebellion that began in January, now command a vast zone the size of Texas. At the end of July, Traore flew home to the Malian capital, Bamako, from Paris, where he spent two months recuperating after being beaten in May by supporters of the coup. And, says commentator Adam Thiam, the north is just one of the problems facing Traore. "Mali is not out of danger. You have, in the north of the country, jihadist groups. You have no army [there]. You have many violations of human rights both in the north of the country and the south of the country, and you have two extremes which run the risk of confronting," he says. "If the right mediation, the right negotiations and the right steps are not taken, one cannot exclude a civil war in Mali. You can't rule it out." 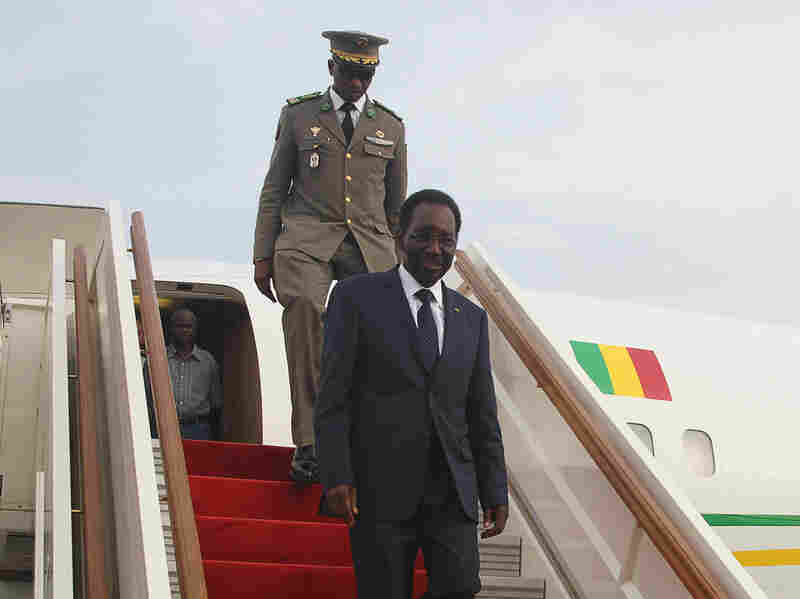 Mali's interim president, Dioncounda Traore, disembarks from a plane at Bamako airport last month. Traore returned to Bamako amid tight security following a two-month stay in Paris for medical treatment after being savagely beaten in the aftermath of the country's coup. The al-Qaida-affiliated Islamists now controlling northern Mali have imposed strict Islamic law; a couple accused of adultery was recently stoned to death. And the Islamists have destroyed World Heritage sites, including the sacred tombs of revered Sufi Muslim saints, in Timbuktu. Mali is overwhelmingly Muslim. Imam Mohamed Toure studied Islam in Saudi Arabia for five years. At his mosque in Bamako, he condemns what he describes as the desecration of the Timbuktu mausoleums. "Yes, I want Mali to become a Shariah nation; but Islamic law should not be imposed by force, by men armed with guns. That's wrong. Only military intervention will push them out," Toure says. "Inshallah, God willing, Shariah will find its own way into Mali and into the constitution." But the extremist Islamists' occupation of Mali's strategic northern cities is just one problem facing the interim government. In the capital, human rights groups, including New York-based Human Rights Watch and Amnesty International, accuse ex-junta soldiers of gross violations. Former members of the presidential guard, who failed in their counter-coup bid, have been detained and reportedly tortured. And there have been attacks and death threats against journalists, who have been abducted and brutally beaten. Demanding an end to the harassment, media workers descended on the streets of Bamako in protest in July. Makan Kone, who heads Mali's press club, was among them. "We are obliged to do something — to talk to the authorities and tell them that our freedom is not negotiable. The government — they are managing nothing. The junta is behind everything [that] happens in this country," Kone says. "The government is doing nothing." Kone, and many others, are furious with Mali's transitional leaders. "It is as if nothing is going on in our country. The country is divided. People are suffering. There is war in the north. And they are here as if nothing is happening — like in a normal country." Many Malians, like Makoro Coulibaly, are apprehensive. They thought they'd left the days of conflict behind years ago. Shopping in Bamako's muddy Badalabougou market for food to break the daily Ramadan fast, Coulibaly appealed to the government to act. "We must unite. ... We must join hands to help our sisters and mothers and friends who live in the north of our country. We want peace," she says. 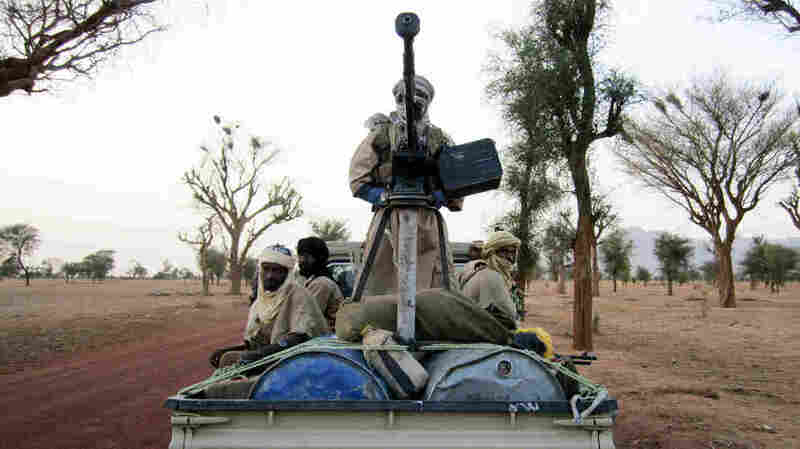 And it's the rebellion in the north most Malians — and Mali's allies — are worrying about. The U.S. is concerned that the extremists have established a sanctuary for al-Qaida and its affiliates in the troubled desert sands of northern Mali. The West African bloc wants to deploy regional troops to the north. For now, though, it's unclear whether military intervention is the answer.